I'm so happy to be done with this quilt. It's a collection of Freshcut fabrics, Amy Butler fabrics, and misc. pieces I already have. As I mentioned before, I was trying to do something different for me - mix things up that don't exactly go together and see how they work. This is what I ended up with. I love each one of the fabrics, but I'm not sure how I feel about them together. I do wish I'd made it quite a bit larger (it's about 42" by 42"), bordered it, and quilted it tracing some of the circles on the backside. I had such a hard time finishing it because I don't love it and I have no idea what to do with it. What does one do with projects that don't quite work? Sigh ... my daughter and my mother like it, so it may just be me, so I suppose I'll try to sell it somewhere. I'll let you know what I end up doing. This quilt makes me so much happier than the first one! This is for a soon-to-be-born nephew. I had so much fun using these fabrics. 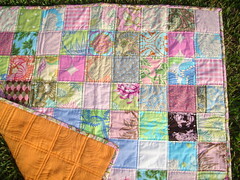 The quilt is loud and busy, but I think it's great for crawling and playing on. The fabrics are fun, innocent, childish ... just the feel I was looking for, I'd actually thought it'd be a little more toned down than it is, the bright red kids and animals was a last minute addition and really changed the look and feel I had for the better, I think. For this quilt I followed, basically, this and this. My original nine patches each used 3 fabrics - one for all the corners, one for all the sides, and one for the center. After I cut them I just set them out randomly. It was a fun, fairly quick, quilt that looks like more work than it was. Gotta love that. 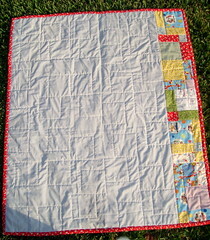 To quilt it I outlined the larger squares. I could have just done straight lines but I wanted to add to the random feeling of the quilt, and I feel good about the results there. The backside is a blue and white stripe that was a curtain in an apartment I had in college ... no - that doesn't make it vintage (yet!). I had extra squares left so I did a row of them across the back. Poor C thinks she's going to keep this quilt. Ha. 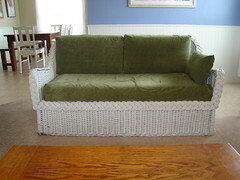 And lastly, before and after of my wicker loveseat. We got this thing dirt cheap at a thrift store years and years ago. It, and quite a few exactly like it, had come from a hotel that was remodeling. We also managed to get two awesome armoires at the same time from the same remodel. The best thing about these pieces is that they are made to last a very, very long time, which is good in our house. 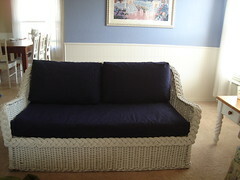 The original fabric on the loveseat is very pretty - blue with sea life on it, but doesn't match our house at all. First we painted it bright blue and planned to keep it in our upstairs hallway for reading. Then we painted it back to white and brought it to the family room, where it stays. The first cover I made was yellow chenille, then a couple years later the green. Jason hates the green. Hates the loveseat because of the green. I have to admit that while I got a great deal on it it was pretty darn not us, just kind of drab. So last night it was transformed to navy blue jacquard. Not fancy or exciting, but such an improvement. I love them all...and like I said..you have way more patience than me if you can quilt. I just find it too time consuming. 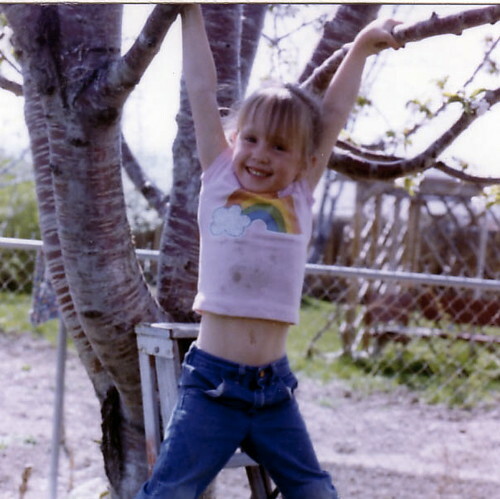 I guess if I made something this cute it would be worth it! 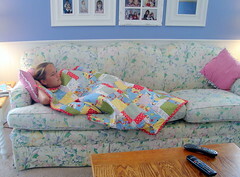 I love, love, love both of the quilts - they make me want to make some quilts! Thank you Beth and Jessi! 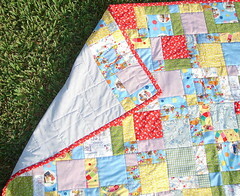 You are tremendously talented, and I'm so envious of the quilting skill...what a family legacy you are creating. How beautiful, absolutely beautiful - and the purses, too! 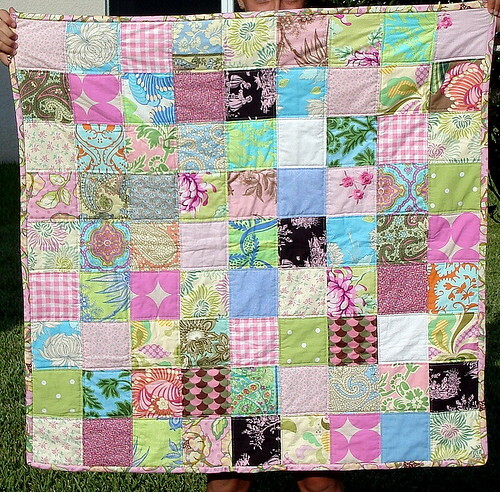 I love the pink tone quilt! Pottery Barn kids but much better! That is seriously genius to just outline the big squares instead of doing straight lines. I have NO clue how you did that but hoping I can figure it out! (beginner sewer... this is my first non-scrap box quilt I will be doing). Thanks for the great idea! 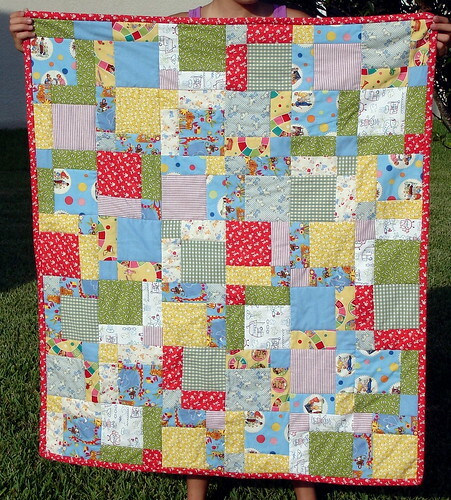 I know this is an old post but I came acrosse it and I love both of your quilts!! The pink one is gorgeous - I love that one and I like that it's just squares! I also love the 9 patch one - so bright. I'm starting a 9 patch and I'm a little leary of cutting up my fabric - I'm not sure how it's going to work out!